Hi All, I'm on my way to prime in Springfield. It's been interesting so far. there's a group of ex crst drivers basically bashing every company known to exist there's one gentleman that's been trying for months to get a training school to accept him. Gaps in employment etc. I feel for the guy because the others are making him question his choices. All the guys brag about their experience and not one has a job. I told the guy whose also homeless to keep his eye on the prize don't listen to the experienced drivers riding the dog. My last day of work. Uncharted territory. Hey Turtle, I'm heading to prime this weekend too. I've been a nurse for 20+years. While I love my job I've always wanted to be a trucker. Nows my time to follow my dream. Good luck to you. Bobby, Thank you for clarifying primes training. They out of all of the companies seem to really care. And I like their training practices. My husband drove for a couple of companies and he was miserable. Of course there are ppl who gripe but this is a career not a job. You have to put the time in if you want to be a good driver. I'm excited and scared but I'm going to do exactly what they tell me to. Danielle, I leave for prime this weekend. I spoke to my recruiter about traing with sims as I've read and watched the same videos. They will place you with a male or female trainer its up to you. If you prefer female trainers you may have to wait until ones available. I also found out they were sued for their policy of not placing trainee females with males if no female trainers were available. I don't care which one I get. But we shall know when I get there. I've also checked into male trainers their of course getting paid to train you but they're professional in how they treat you. If there was a complaint of sexual misconduct they act immediately. Hi All, I'm heading to prime this weekend. My recruiter Barbara Brown has been awesome. I'll have to wait until the 28th to get a trainer due to the holidays but was told I could practice on the sim all I want which is fine by me. I'm excited and scared at the same time :-) :-). Everybody Have a Safe Merry Christmas!!!! Don't waste your time learning how to shift a manual transmission in a car or pickup truck. Shifting a big truck is completely different! 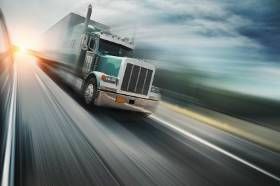 The best you can hope for by learning to shift before you begin CDL training is incorrect methods that you'll have to unlearn once your in the big truck. The best use of your time - before you start CDL training - is to study the material for your learners permit. Use the High Road Training Program on this site to learn practice for the General Knowledge, Air Brakes, and Combination Vehicle exams. Those are the three tests that you must pass to get your learner's permit. Once you master those topics, you can study Hazardous Materials (HazMat), Tankers, and Doubles/Triples which are not required, but are good to have on your license (you can never be overqualified). My point with her learning to drive a stick is only so that she would be less nervous when learning to drive a big rig. Yes they're different but they also both have clutches and a stick. And if you can drive a stick your more apt to pick up a big rigs system better. And studying for the cdl is a gimmee. I hope she goes into trucking if that's her dream. I'd rather be nervous in a vw than a 80,000 lb vehicle. Hey! My fave thing to do on down time I cook up steak for phillies. Let it cool put it on good bread wrap it in foil and put it in the lunch box about 30 mins before it's time to eat. You can get disposable bread pans and heat soup or chili up in them . I get the mini tins and do meatloafs and veggies it will fit 3 in a row in the lunch box. All the prepped food can go.in the plug in cooler. Anybody have advice on Prime driver trainers? Get someone to teach you to drive a stick. My dad put me in his old ford pick up with 3 speed on the column. He drove to an empty parking lot showed me the gears got out and told me to drive. I had it down in 20 mins. Thats all I drive now. I hear DOT wants all automatics by 2018 :-) FYI I'm going to prime saturday to start training. Go for it!